The Utopian Inn is located in the heart of the Lake of the Ozarks on mile marker 41 in Alcorn Hollow Cove. This lake getaway is on 100 ft. of shoreline. A perfect location for all of your lake vacation activities. The 3 bedroom 3 bath home is newly remodeled with all the extras to make your stay truly comfortable and easy. The large deck with spectacular views of the lake is a perfect place to sip wine at the end of a fun filled day. You can also enjoy the large balcony off the upstairs bedrooms if you want to get closer to the bright evening stars. Enjoying the lake could not be any easier than from the large private covered boat dock with boat lift, swim platform and complimentary paddle boat. However, if you are looking for a rowdy party house, please look elsewhere. Ashtrays are provided for outside smoking. Fireworks are NOT permitted as this is a wooded, residential area. Some pets are considered . Please contact us for details and additional charges. 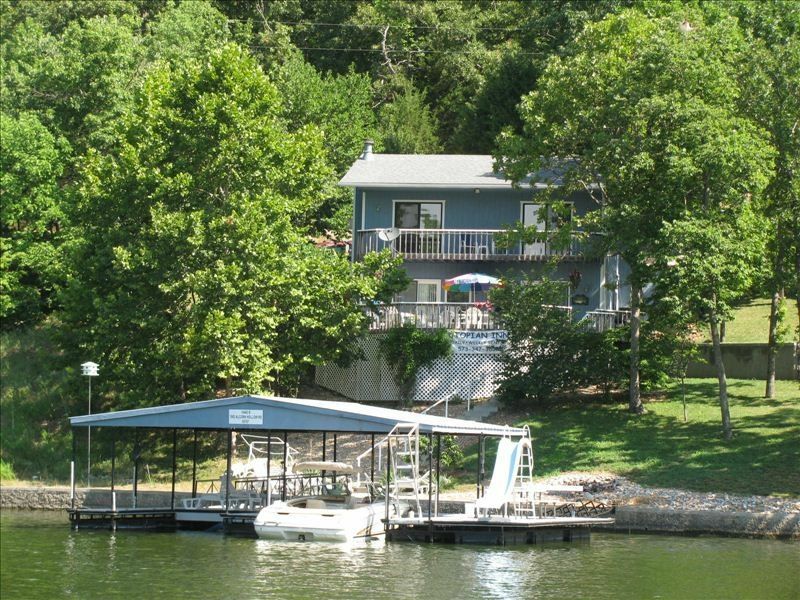 Utopian Inn is located on the 41mm of the Osage Arm of the Lake of the Ozarks. The balcony is off the two king bedrooms overlooking the lake. Deck overlooks lake and patio is off-set out of the sun overlooking wooded area. We have a tube to pull the kids in the water. Enjoy the lake with our pontoon paddle boat. Our family had such a relaxing and fun time at Utopian Inn. The house has everything you'd need and was extremely clean. The slide on the dock was such a plus--our kids loved it. The cove was quiet and perfect for fishing. The owners were very helpful--giving us tips and recommendations of places to go visit on the lake. Be sure to ask Linda about boat rental--you won't be disappointed. We hope to get back to Utopian Inn! My husband and I, including two other couples stayed at the Inn for 3 nights. We had a great weekend getting away from life and just enjoying the lake. The house was fully equipped with everything we would possibly need and if anything was missing Linda was just a holler away ;) Icing on the cake was us being able to bring our fur babies. Most houses do not allow pets but this one does! Oh and the house comes with a boat but unfortunately we weren't able to use it due to the weather. The drive was a little scary to get to the house but after driving it once it was super easy. Linda made the whole booking process very easy and smooth. Didn't have any problems with booking. This is an excellent house and we will most definitely be visiting again soon. Away from it all ! Wonderful house and lake location. Very clean and comfortable and well equipped. Was looking for quiet relaxing lake location and this place exceeded our expectations. The availability of the pontoon boat rental onsite was a real plus. Very flexible and reasonable rental terms. Great lake views from both upper and lower decks. Linda was a wonderful host and made you feel right at home. Only caution would be the steps. If stairs are an issue for you this may not be the place for you. Bedrooms are on upper level. Several but safe and easy steps to dock. Had a great time and will definitely return. Utopian Inn is located in our favorite cove on the lake. The house was clean, nicely decorated, with comfortable beds/furniture, three full bathrooms, and a spacious kitchen/dining area,. Our family of seven were very comfortable and had everything we needed. We were pleased to have free Internet and satellite TV. Our cell phone coverage was a little spotty, but sometimes that is a blessing in disguise! Outside was a nice large gas grill, large deck with a beautiful view. The dock was easy to get to, and had a boatlift, jet ski lift, paddleboat, and fish cleaning table. Linda was a great host; one of the nicest people I've ever met! Even though this was our first time meeting her, I felt like I've known her for years! Our family will definitely be back next year! My wife, 5 year old daughter and our friends and their 4 year old son had a great time at the Utopian Inn for a long weekend. The fall view was excellent with the lake and the autumn colored trees added to the beautiful scenery. The kids loved the house, the fishing and the nature walks they took. We fished a lot and caught several catfish to keep us happy. The beds were excellent and everything we needed was in the inn. Our hosts were great and offered help us with anything we needed. This inn is a great place to unwind no matter what time of the year it is! The Utopian Inn was the best choice for our 4-day getaway. Not only is the home well maintained and accommodating, our hosts Linda and Jane went above and beyond to make us feel welcomed ... they are terrific!! We will definitely keep the Utopian Inn at the top of our future trips list, and gladly recommend this property to friends and family. A pontoon boat is available for rent for $200.00 per stay. This offer is for clients only.